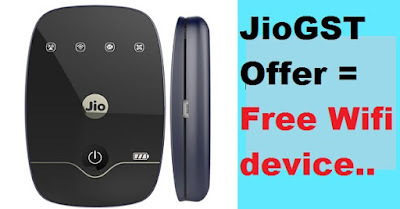 There is a new offer from Jio which is JioGST Starter Kit worth Rs 1,999/-(Device),which is announced on Thursday i.e 06/07/2017 and getting deep into the details of the JioGST starter kit the billing application and GST software is absolutely free along with this there are also giving Jio WiFi device with 1 year free unlimited calls,24 GB of 4G data. 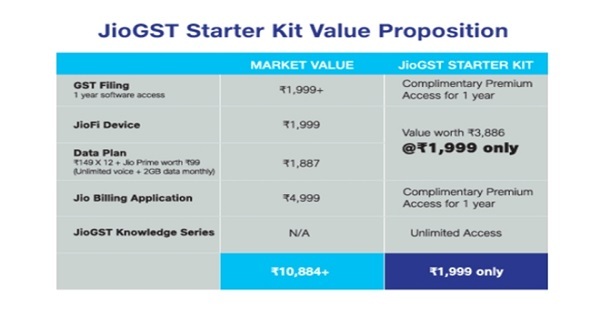 Added to the above offers,the customers will also get 10884 /- value services are going to be available for the user who gain this JioGST starter Kit. According to Jio official website the customers are going to get this device which has the market price of 1999/- for free.The end users can buy the JioGST starter Kit in the EMI basis. JioGST consists JioGST solutions which is helpful to the pay taxes according to GST. by Jio App Best GST solutions app,the retailers can apply for the best tax returns from GST.This application is also helpful to maintain any records regarding tax.The user will get this service s for one year.